Queen Of Katwe, an English movie, is not currently screening in Hyderabad. A pawn on the battlefield, bloodied and maimed, witnesses the glory of her kingdom fall; but instead of surrendering, picks up the mantle, struggles her way to the last block and becomes The Queen. And if that also looks every bit as rousing as it sounds, it's the effect of the inspired synergy of Mira Nair, Disney and ESPN. 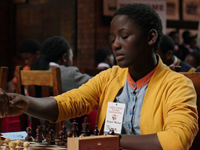 Based on true events and American author Tim Crothers' eponymous novel, Queen Of Katwe is a war story in every sense - and one gloriously translated to screen. fullhyd.com has 700,000+ monthly visits. Tell Hyderabad what you feel about Queen Of Katwe, and then also see all user reviews for Queen Of Katwe!